Every year that we’ve planted a garden at the house (for those of you not keeping score, the number is 4), I’ve announced that I’m going to have a salsa garden. Each spring I’ve started out by planting all the ingredients for salsa. I excitedly bury my pepper and tomato seedlings in the garden and declare that this will be the year that we’re swimming in salsa! But something always ends up going wrong. The garlic doesn’t come up or the tomatoes under-deliver in their bounty. Well, mark it in your calendars, folks, that 2017 is the summer of the salsa garden at the Delbert Meier house. The tomatoes have come in strong, garlic is abundant and the peppers have performed. And what I’ve lacked in ingredients from our own garden, I’ve managed to pick up at farmers markets. Salsa is one of those simple recipes that makes you question ever buying it from a grocery store. In addition to the veggies, it’s really just some vinegar, salt and herbs all mixed up to make a yummy dipping sauce. I improvised my recipe for salsa so my measurements aren’t exact. I did check the label on the side of a jar of salsa to confirm that I was on the right patch with ingredients. But from there, it’s all a matter of taste. Roughly chop all ingredients and place all but cilantro in a large stockpot. Cook on low to medium heat, stirring occasionally, for about an hour. (For a thicker salsa, simmer on low heat for up to eight hours.) Use an immersion blender to puree the cooked mixture. (Or, blend the hot mixture in batches in a blender or food processor. But be careful!) Add chopped cilantro to the blended mixture and return to stockpot. See, I told you that the salsa recipe was easy, didn’t I? 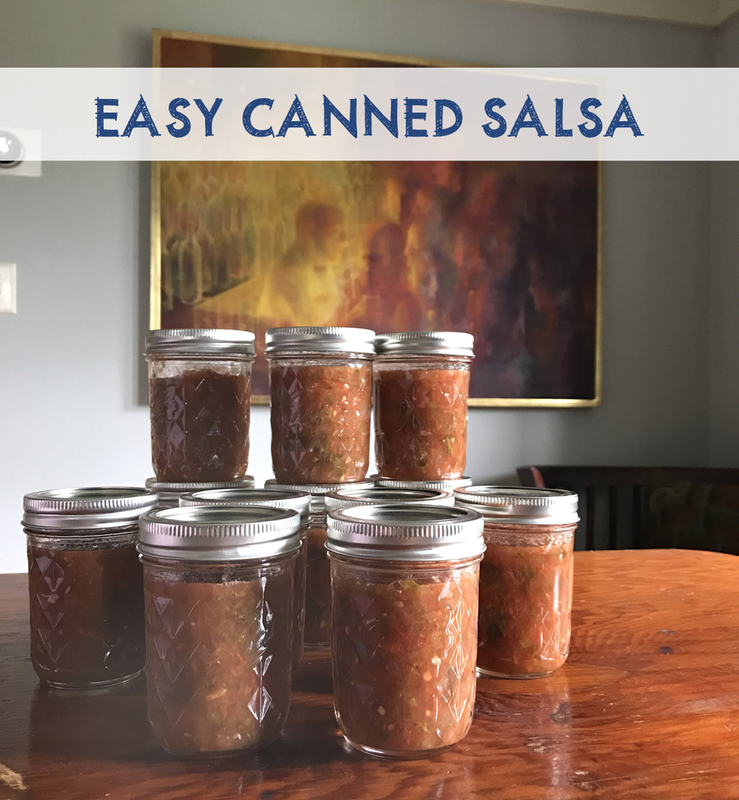 Well then trust me when I say that canning salsa is easy too. You’ll need the supplies: a basic canning kit (which consists of a large water bath pot and rack) along with jars, lids and rings. Once you have the supplies, the canning process is actually quite simple. I’m including some basic instructions here but the Ball/Kerr website provides a thorough resource for beginning canners. First, fill you water bath canner with water (enough to cover the tops of the jars when they’re submerged) and heat on high until boiling. Then reduce heat to keep the water simmering but not boiling. Next, thoroughly wash the empty jars and lids and then cover them in boiling water. What you’re doing here is making sure that you’re putting your salsa into a clean, sanitized jar. I usually hand wash my jars and then place them in the water bath pot for a few minutes. And then I place the lids in a small bowl and pour boiling water over them. Then, place the hot salsa in the sterilized jars. Wipe any salsa from the rim of each jar and place the sanitized lids on top. Lightly screw the rings on top of the jars. 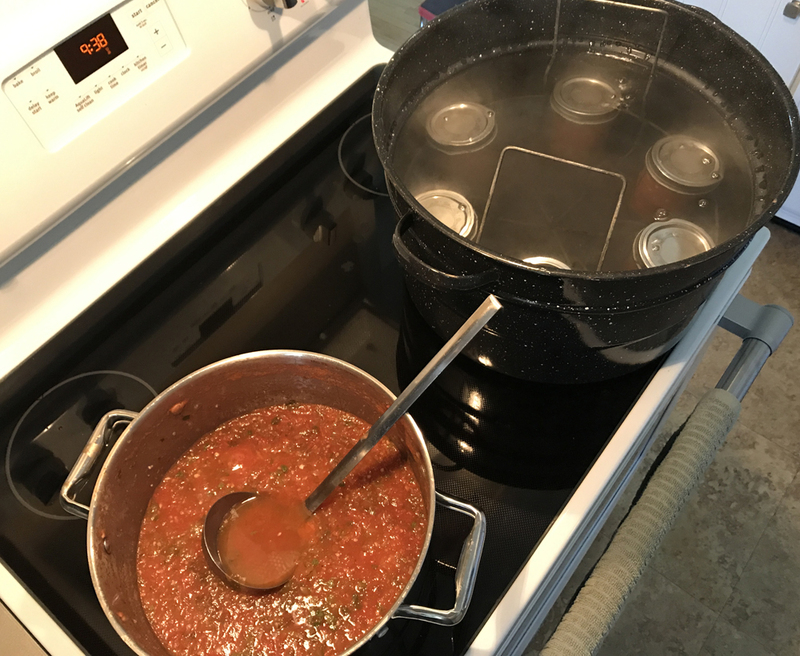 Now, place the jars of salsa in the rack of the water canner and slowly lower them into the pot. Leave the jars submerged in the water for 10 to 15 minutes. When the time’s up, carefully remove the jars from the water canner and place on top of a towel on the countertop. You’ll likely hear the lids pop, which is your sign that the jars have created a vacuum seal. I usually wipe the excess water from the jars and lids after they’ve cooled a bit and then add labels before placing them in the pantry. Time consuming? Yes. But also easy, right? 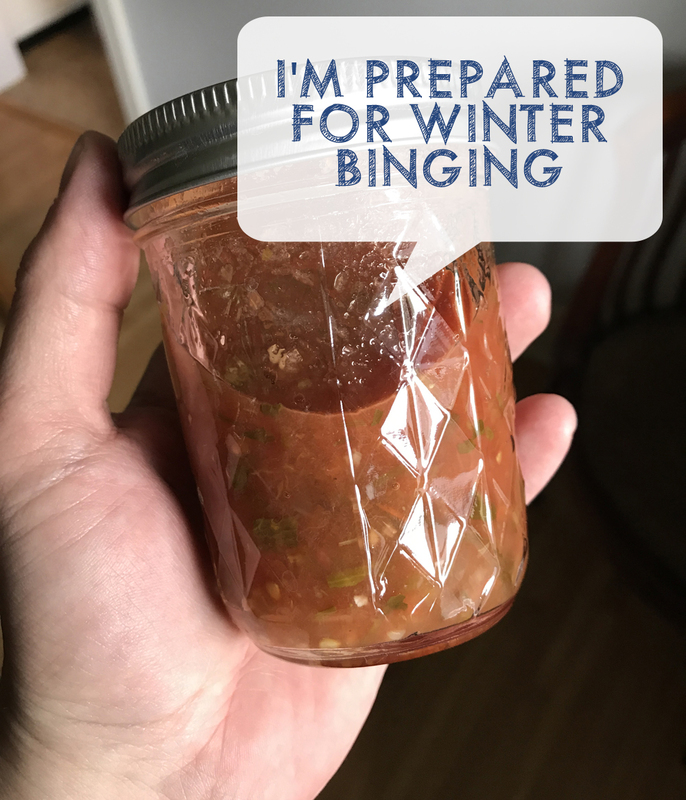 And on that cold winter night when we’re binge watching Netflix, this salsa is going to be so very delicious! 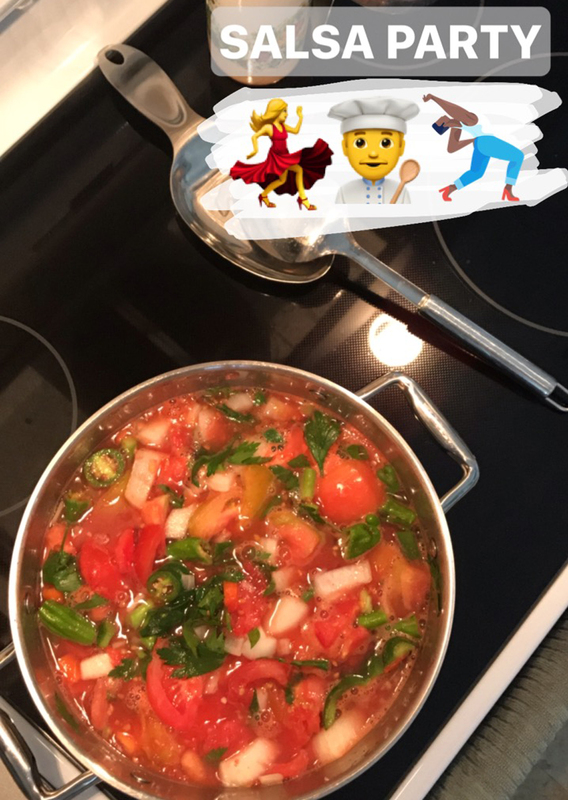 This entry was posted in how to, kitchen, recipes, setting up home on 08/27/2017 by Jason.